TOCNET®-Classic (TOCNET-C) is SCI Technology’s original networked, off-the-shelf digital Unified Voice Management System (UVMS) for a wide variety of mission-critical applications. Battle-tested and proven in every branch of the U.S. Armed Services, TOCNET-C offers outstanding customization, interoperability and reliability for full-scale intercommunications in the most demanding tactical environments. With advanced hardware and flexible, software-defined architecture, TOCNET-C is ideal for applications that require a feature-rich product directly out of the box. 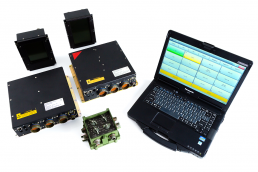 With broad capabilities for linking tactical ground, air and vehicle assets, TOCNET-C is the UVMS solution of choice for intercom projects throughout the Department of Defense. TOCNET-C is fully capable of supporting legacy systems and integrating with emerging technologies. As a fully digital system, TOCNET allows for bridging, cross banding and conferencing of various disparate assets such as radios, phone lines, VoIP and network IP. Battle-tested from Korea to Afghanistan for more than a decade.